After several years of use, the leather in your car or sofa can crack and rip if it hasn’t been properly cared for. Or, your dog can tear into it way before it begins aging on its own as you can see from the picture above! It’s amazing how quickly leather can go from looking luxurious and expensive to looking brittle and cracked. Aside from pet damage, wear and poor maintenance are the main culprits of damaged leather caused by body oil. The leather becomes darkened where the body oil has penetrated, creating cracking and brittleness. 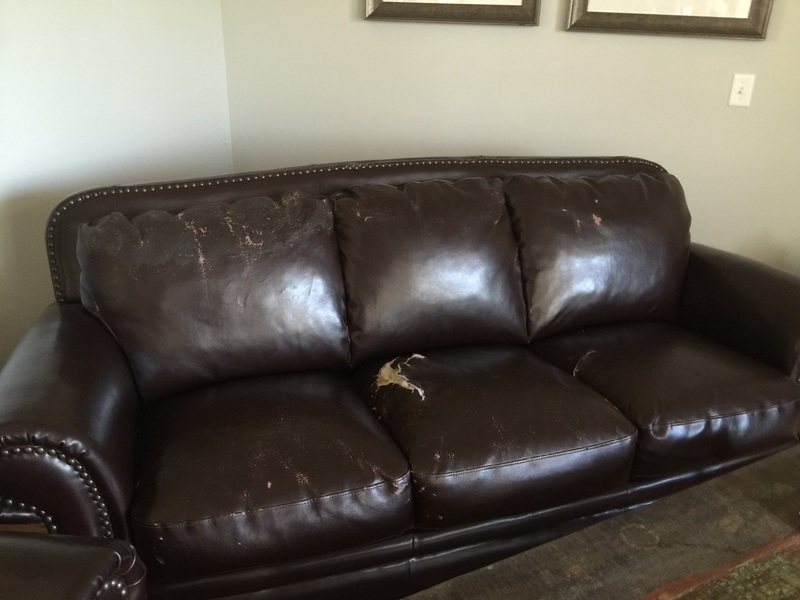 When the piece hasn’t been cleaned and maintained regularly and the damage has set in, then the leather cannot be repaired (unfortunately); the damaged area is removed and replaced with a new piece of leather that will match the existing leather.